The ZR EMK is the result of countless hours of R&D, Engineering and testing and it is without question the Wireless EMK System that established the benchmark of technology, functionality, versatility and quality of construction. The Brain Engine features an exclusive Stainless Steel Mounting Plate that can be adapted to any PWC currently on the market and allows for multiple mounting locations. The Trigger Unit has an adjustable wrist strap that securely keeps the unit attached even if the Rider momentarily loses grip of the unit. The Trigger has a solid feel and the signal transmission between the sending unit and the receiver unit is flawless thanks to the implementation of an extra long antenna on the receiver. The transmitter uses two AA batteries (not included) that are located inside the watertight handle. The Digital Servo Motor features all steel gears inside a full aluminum case that is light weight while delivering incredible torque and efficiency with low power consumption. 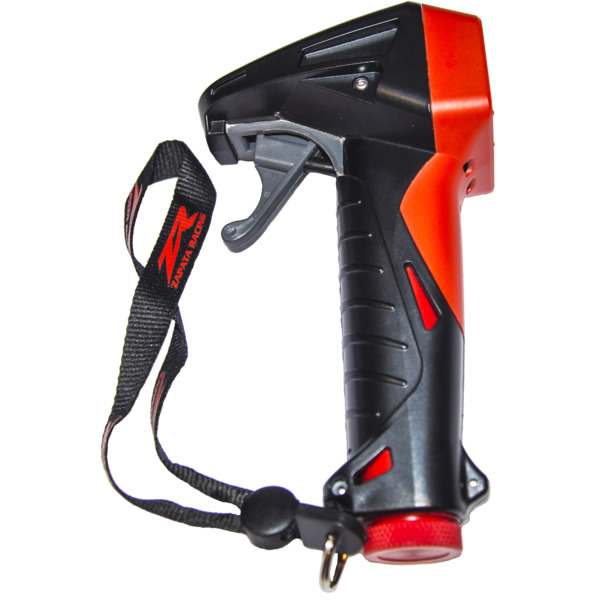 Must be used in conjunction with item KAE0001-Electronic throttle adapter kit when attached to a PWC that has an Electronic Throttle. Level five is set up for Professional use and for in water dives.